Recitation troupe Bakshilpangan premiered their 14th recital production ‘Desh Chara Ghor Chara’, compiled by Monowar Mahmud Jewel and directed by Azharul Haque Azad, at Experimental Theatre Hall, BSA on February 22, 2019. ‘Desh Chara Ghor Chara’, a compilation of 25 poems and stories penned by local and foreign poets and writers including Indian poets Sabyasachi Goswami, Achintya Kumar Sengupta and Kabir Humayun, Palestinian poet Mahmoud Darwish, Tibetan poet Dalai Lama, Chilean poet Pablo Neruda and Bangladeshi poets Hasan Mehedi and Abul Momen, portrays the plight of refugees and displaced people. 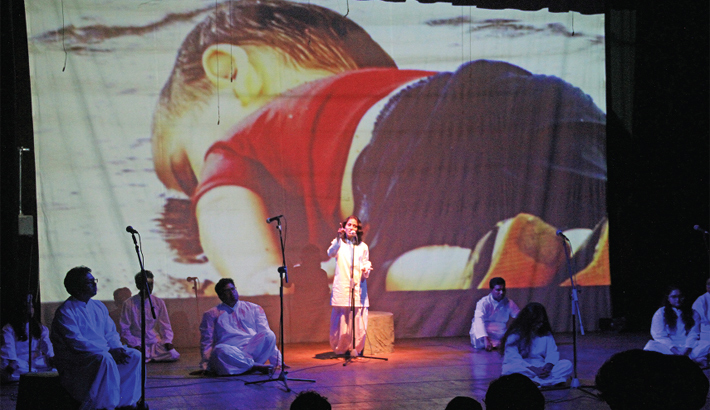 The performance focused on the sufferings of the refugees (refugees during the Liberation War (1971), Palestinian and Syrian refugees, Rohingyas and others). Bakshilpangan artistes Dolly Das, Bushra Ahmed, Hasib Billah, Ahmed Isha, Rebeka Sultana, Monowar Mahmud Jewel, Nandita Saha Nitu and some others performed in the production. The music was composed by Joy Sahriar and stage-lighting was designed by Aslam Aronnho. The audience enjoyed the performance and appreciated their efforts.